Yesterday I attended Day 1 of the Big Church Day Out – a two-day Christian music festival on the grounds of a stately home situated at the foot of the South Downs, on England’s South Coast. A few days before I was due to see Salvador, the Internet threw me another good reason to want to speak to them. A certain right-wing commentator had decided to spew some bile on immigrants (again), and had written a column basically claiming that there were “too many Latinos” in the USA (I’m not even going to dignify such nonsense by naming the person or posting links to their writing; I suggest you google ‘too many Latinos’ yourself if you want to know who it is and what he/she/it wrote). And so when it came to my turn to fire a question at Salvador during their press conference, I knew exactly what I was going to ask. NIC: “I think that any time people talk about there being ‘too many’ of something, it’s spoken out of frustration. We certainly give grace where we believe grace would be given. People who speak that way have obviously come into a bad encounter with a person of Hispanic culture, or maybe they’re frustrated by something. Any time you’re overwhelmed, or feel like you have a lack of something, you’re looking for someone to blame. CRAIG: “As a white person, I think it probably offends me more than it would offend them [cue laughter from the Hispanic band members]. I think Chris (Bevins, the band’s keyboardist) would probably feel the same way. It kinda baffles my mind, the small thinking of some people. 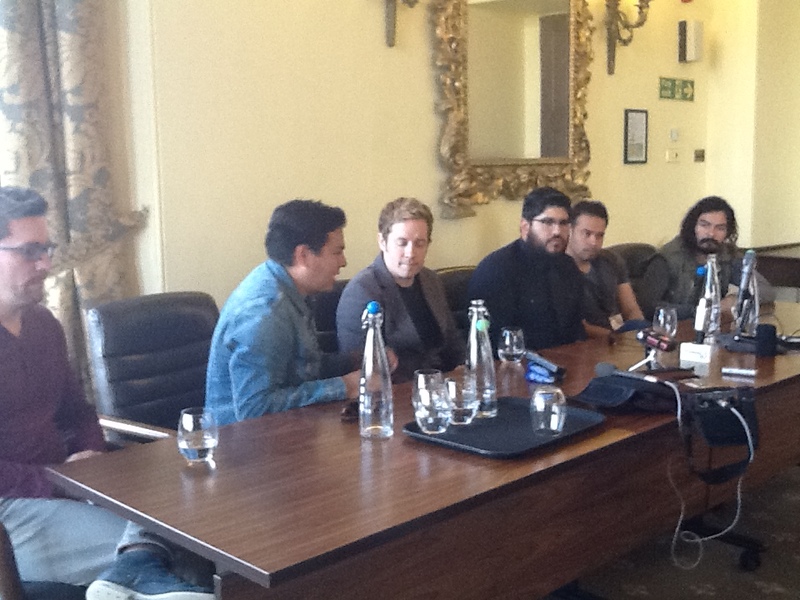 Salvador at their press conference. Nic Gonzales is second left (in the blue shirt); Craig is on the left. Alejandro is at the other end; on the right.